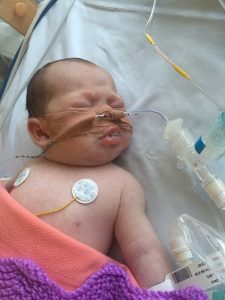 When Darcy was two weeks old, what we thought was a common cold quickly escalated to her being unable to breathe. We took her to the local hospital where she was stabilised, intubated and taken by ambulance to the PICU at St Georges Hospital. was being hidden from us. All of the staff who work in PICU are amazing, absolute angels who looked after our baby as if she were the most important person to them. We as parents also felt looked after, being separated from Darcy’s twin and seeing our daughter so poorly, was stressful but the nurses looking after her also made sure that we were taking breaks and getting food as well as asking us how we were feeling. Darcy made a full recovery and was reunited with her sister within a week. It was a tough week which was made bearable by the wonderful staff in this wonderful unit. 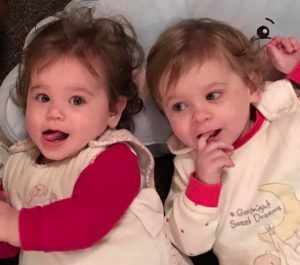 This entry was posted in Patient Journeys and tagged bronchiolitis, Darcy, life support, paediatric critical care, Patient Stories, PICU, twin. Bookmark the permalink.